As far back as I can remember I have always created, whether it was a piece of paper folded into origami or a custom hand made table. The act of making comes natural to me and the most important tools in the studio are my hands. This market will actually be one of the few times I've exhibited and sold my artwork at a handmade community fair so I’m hoping for the best. To be honest I actually feel that the true artist is nature itself, I'm just presenting it in a way that can be appreciated as artwork. I love materials and how they exist just as they are, the texture of clay when dry creates a network of cracks, the patterns found in wood grain or on a leaf. These are the things that influence my work and push me to create. Most of my inspiration comes from nature and the patterns, textures, and geometry found within it. The several artist that have a huge influence on my work are Bryan Nash Gill, Analia Saban, and Andy Goldsworthy. All of these artist in their own way incorporate nature, texture, and pattern which I strive to achieve. I have to create to feel mentally and physically healthy. Without making and creating I kind of feel lost. Surfing, hiking, and just being immersed in nature definitely contributes to my creative process. The duality of my creative process can vary. At one moment it can be very methodical, planned out and hypnotic and on the other hand it can be completely spontaneous and random. It depends on what I'm trying to achieve at that moment in time spent in the studio. The best piece of advice I have ever received was from the artist Bryan Nash Gill who told me to keep creating and to really listen to my process, to let the work take me there, to show my work wherever and whenever I was given the opportunity. He said that one of the hardest things for any artist to achieve is to be noticed by a gallery unless you are the lucky 1% of artists that do get picked up by one. He told me that I may be a gallery artist but I also may be a great craftsman. Quality pieces that I put my heart into. Each piece that I make has a high standard of craftsmanship. These qualities and attention to detail are what I put into all my work whether it's an art piece, a custom table or a walnut cutting board, each piece is made with love and is held to my highest standard. You can learn more about me on my website www.andremirzaian.com and on my instagram profile andremirzaian. I've always tinkered with creating things but it wasn't until my son was born that I really got interested in the handmade/DIY community. As a stay at home dad (before that was a thing), I had not only the time, but the desire to create for my son objects and items that could not be purchased at stores and also try to instill in him the value of hard work. Although there are lots of woodworkers (and the more the better, I say), I feel that most craftspeople work in the "functional" aspect of woodworking. Cutting boards, pencil holders, boxes of all sizes, furniture, etc. are all great things but, to me, they loose some of the simple joy of the medium. I make designer wooden toys because I want people to experience wood not as just the functional resource it becomes but also as the magical, living material it remains. I pull my inspiration from a multitude of artists. 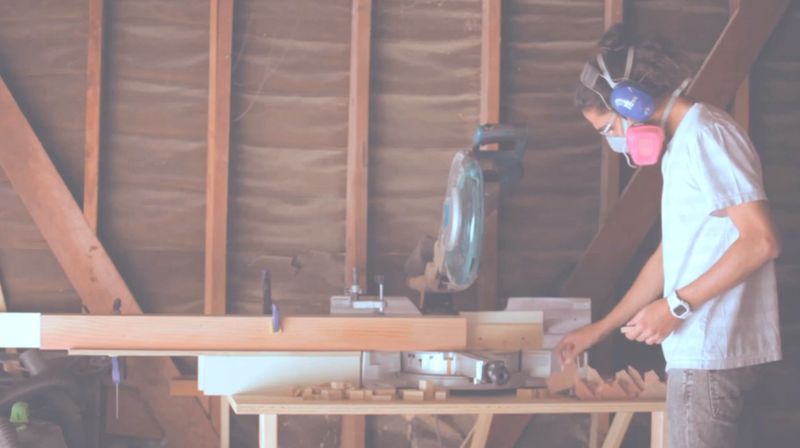 Woodworkers like George Nakashima and Sam Maloof. Other toy makers like Takeji Nakagawa and Pepe Hiller. Also cartoonists, John K., sculptors, Richard Serra, and musicians The Dreadnoughts. Although my work appears simple in concept and construction, I spent numerous hours planning everything from the shapes of the arms to eye placement on each Winklebean character. I've been known to sit with a block of wood or a length of board for months until I can figure out exactly what character trait the wood is calling for. While the cutting, drilling, sanding or other aspects of the craft are nothing special, it is the act of character creating, the "bringing to life" an object that I take most pride in. An art school instructor once told me that to be an artist, one must always be making. Even if it's crap, even if it winds up in the trash, it is the act of making that matters most. We can all imagine the most profound works of art or the most beautiful crafts but until they get made they are nothing. It's only through making, and constantly making, that any thing is ever achieved. So even though my trash can is full, I just keep making. I've been branching away from the original character Winklebeans for awhile now but for Jackalope I'll be coming back to them. I'll use the same sizing but I'll be incorporating paint into the new ones in a series I'm (tentatively) calling SportyBeans. While I love the natural look of wood, the effects one can achieve by contrasting the warm tones of nature with the vibrant hues of modern colors in something I'm enjoying exploring. I hope to have 5-6 fully developed new characters for the Jackalope show in Pasadena. You can follow along with me on Instagram @winklebeans, or our Facebook page @winklebean or order off our website www.winklebean.com or better yet, come to one of the shows and hang out for a bit. I would describe my style as geometric, organic, masculine and feminine, minimal at times and over the top at others. I recently went to the MoMa in SF and finally saw some of Richard Cerra’s work and I totally love it. I love how raw his work is. I think there is an incredible amount of beauty to be found in the rougher things in our world. I also love the work of Ellsworth Kelly. His forms are so clean, minimal and refined, kinda genius how his pieces interact with light. I’m also inspired by a lot of local artists who I’m friends with. Anna Sofia Amezcua, is a wonderful abstract painter. Her work is passionate, soft and explosive and her use of colors is incredible. She’s actually inspired me to try my own hand at painting, which has lead to the hand painted effects that I use on my woodworks. There’s Also Shannon Sullivan, who is a talented ceramicist. I love her process and how she uses a limited amount of shapes in forms in different ways to create so many different pieces that look so distinct from each other. Also, there’s Peggy Loudon, another ceramicist. Her work is refined and clean and very precise and is informed by traditional, beautiful practices. All of my compositions feature triangles. I try to use them in as many ways as possible. I try to find a balance between controlling my materials and allowing the natural, rough stuff to shine through. I’ve always been really fascinated by people and the things that they create. I think that the hardest thing to do is to understand another. There’s a really special sense of knowing a person when you can see what they’ve created. It’s sort of like the old notion of, I wonder if the red I see is the same red you see. I can understand what you are saying, to an extent I can understand what you are feeling but when you create something it’s a synthesis of all of your thoughts, feelings, experiences and hard work. So that can really be anything that people make: paintings, architecture, sculpture, beautiful food presentation, etc. I just try to find any place where people are expressing themselves as purely as possible in what they are creating. That’s the thing that excites me, that’s the thing that makes me want to respond by creating myself. I feel the most creative when I’m in my shop. I have big piles of\ raw materials, processed materials, paints, glue, nails, etc. I sometimes feel anxiety about making things or life, but when I’m in my shop, I feel very focused and the rest of the world can be put aside. I love getting into the process of making things. There’s a lot of tedious aspects to what I do, but I love it and embrace it, it has become to me a meditation. I do a little bit of sketching, not as much as I use to. When I’m working out new ideas or color schemes, I like to try them out with making small pieces. I might make 15-20 small things until I feel confident that I know what I want to do on a larger scale. I mostly build all of the pieces in my mind before I even cut a single piece of wood. But while I’m actually making the piece, I do allow myself to take a detour whenever I get a new idea. For me, rules and order allow me to actually be more free and creative and strike out in a different direction. 7. Anything you'd like to add that I didn't ask….? I make art in part as a political statement. We live in a time where unfettered capitalism is the largest and most permeating religion that humanity has seen. This comes at a huge cost to our environment and to each other. We are faced with systems that are tearing us apart from each other and the earth, and causing us to harm and consume everything as much as possible. Ecosystems are destroyed, entire species of animals are wiped from the planet. What we receive from this system in turn, is a bunch of useless, soulless junk that is designed to fail. We have had our psyches hacked and have bought into materialism and money as a source for meaning. I want, as much a possible, to know that every step of the process of what I create is made with intention. Where do the materials come from? How are thepeople working with the materials I use treated, paid; what are their working conditions like? How is the environment treated? I want how and why I make things to be central to my art. I want to make thingsthat reduce our environmental impact, I want to make things that last. Ultimately, I want to contribute to a society in which people are paid what they are worth, and through my work, create a place that is supportive of happiness.